Publication details: Book. 2007. viii and 279 pages. Publication date: 2007-09-06. with 102 illustrations, of which 42 in color, 12 tables. Hardbound. 16x24 cm (6.3x9.4 in). 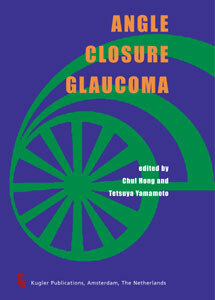 It is a great pleasure and honor to announce that members of the Asian Angle-Closure Glaucoma Club (AACGC) have finally launched the publication of the Angle-Closure Glaucoma textbook. We, the editors of the AACGC, would like to convey our deepest appreciation to the members of the AACGC who dedicated their time and efforts to developing the book, and celebrate this landmark publication in angle-closure glaucoma with all of the members of the AACGC. On October 18, 2001, the AACGC was founded by Chul Hong, Yong Yeon Kim, Ki Ho Park (Korea), Tetsuya Yamamoto (Japan), Prin Rojanapongpun (Thailand), and Kwou-Yeoung Wu (Taiwan), with the aim of playing a leading role in the resolution of prevailing issues related to angle-closure glaucoma in Asian countries. The incidence of angle-closure glaucoma is common throughout Asia, and numerous people have lost their sight as a result. Before the AACGC was established, there had been no sufficient coordination among glaucoma specialists in Asian countries with regard to terminology, classification, and pathophysiology as part of a scholarly effort among glaucoma specialists. On October 18, 2001, a few forward-thinking, young Asian glaucoma specialists took initiatives to set up the AACGC as an Asian-wide scholarly club with the intent of playing a key role in resolving issues related to angle-closure glaucoma. The Organization Committee was soon formed, and it was decided that the first meeting of the AACGC would be held in Seoul, Korea. The Organizing Committee included Advisory Committee members (Dong Ho Youn (Korea), Yoshiaki Kitazawa (Japan), Por-Tying Hung (Taiwan)); Committee members; (President Chul Hong (Korea), Vice-president Tetsuya Yamamoto (Japan), General Secretary Yong Yeon Kim (Korea)); and Scientific Committee members (Ki Ho Park (Korea), Ningli Wang (China), Paul Chew (Singapore), Prin Rojanapongpun (Thailand), Kwou-Yeung Wu (Taiwan), Goji Tomita (Japan), and Tsing-Hong Wang (Taiwan)). The first official meeting of the AACGC was held in Seoul, Korea on November 7-8, 2002, with about 110 Koreans and 27 foreigners attending the meeting to address the characteristics, terminologies, diagnosis, and treatment of angle-closure glaucoma through 33 presentations and subsequent discussions. Professor Chul Hong chaired the meeting. Research papers presented in this first meeting were published under the title "Angle-Closure Glaucoma Update 2002" in November 2003, serving as the start of the written history of AACGC. The second meeting was held in Bangkok, Thailand on November 28, 2003 with about thirty attendees, in conjunction with the 19th Asia-Pacific Academy of Ophthalmology. This meeting was chaired by Professor Prin RojanaPongpun. The third meeting was held as a pre-meeting event in Wuhan, China, on September 7 8, 2004 in conjunction with the Annual Meeting of Chinese Ophthalmological Society, with about thirty attendees to address the latest in research activities. Professor Ningli Wang chaired the meeting. The fourth meeting was held in Taipei on October 29-30, 2005. This meeting was chaired by Professors Kwou-Yeung Wu and Tsing-Hong Wang. About fifty attendees held two special symposiums on ACG, and 32 topics were presented and discussed. The fifth of these meetings is to be held in Gifu, Japan on September 15-16, 2007 in conjunction with the Annual Meeting of the Japan Glaucoma Society, and Professor Tetsuya Yamamoto will chair the meeting. A total of 34 topics, including special lectures, will be presented. Since its founding in October 2001, the AACGC has held four meetings and has actively undertaken activities to promote its missions. The consistent attention and support of the members has been a key in the success that the AACGC has achieved through its annual meetings. Although the AACGC has grown into an important scholarly club over a short period of time, members still need to forge an alliance through information exchange and cooperation, and must pursue future-oriented collaborative studies, keeping in mind the dreams and visions for the future of the AACGC. As a way of forging cooperation among members, the publication of the ACG textbook was suggested in the board meeting, held in October 2005, and executive board members agreed to pursue the project. Chul Hong and Tetsuya Yamamoto were appointed as editors, and Ki Ho Park (scientific committee member) and Yong Yeon Kim (general secretary) were appointed as associate editors. The executive board members as well as scientific committee members from each country were appointed as regional editors. and reviewed by editors over a three-day period. In the AAO meeting held on November 12, 2006, Ki Ho Park (associate editor) met Mr. Peter Bakker, the CEO of Kugler Publications, and discussed issues that needed to be addressed prior to the publication of the book. Despite time constraints, Kugler expedited its process for the AACGC, and published the book as scheduled. The published book will make the forthcoming Gifu meeting a festival environment for all members of the AACGC. Dear fellow members, we have finally developed a book of ourselves, by ourselves, and for ourselves. After a great deal of hard work and dedication by the members of the AACGC, our dreams of publishing this book have finally become reality. This book will remain a precious asset of the AACGC. It was a time of joy and excitement for us to edit the manuscripts that had been eagerly prepared by authors, and it has been a tremendous honor to write the preface of the book. We attribute the successful publication of the book to all of the members who have been dedicated to the activities of the AACGC since the foundation of the club, and to those who have written manuscripts for the book. We would like to thank them for their dedication and excellent work. We would also like to thank AACGC regional editors for their service in inviting authors and contacting authors for the submission of manuscripts; and Professor Ki Ho Park and Professor Yong Yeon Kim for their significant contributions to the editing process. We should also add that the book would not have become available as scheduled without the kind assistance of Mr. Peter Bakker and his son, Mr. Simon Bakker, of Kugler Publications. We offer our sincere thanks for their valuable assistance in the making of final decisions and for publishing the book.